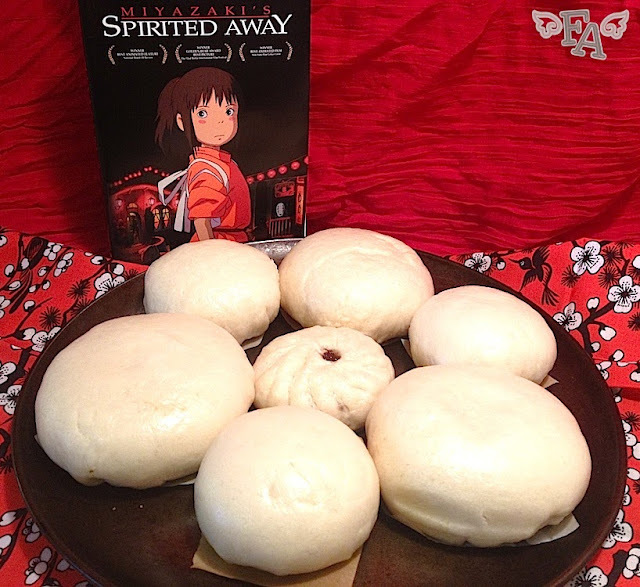 Fiction-Food Café: Steamed Buns from "Spirited Away"
Steamed Buns from "Spirited Away"
Food plays a major role in the Studio Ghibli animated film "Spirited Away", not only by adding to the richness of the Japanese spirit culture depicted in the film, but also by adding layers of meaningful storytelling through food symbolism. 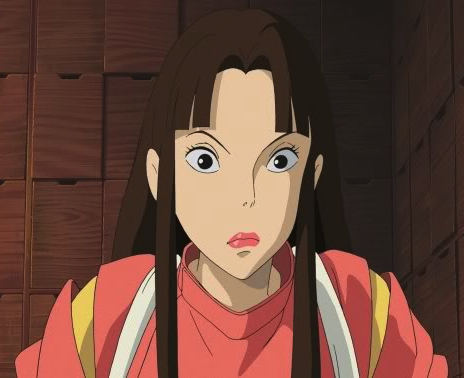 Lin is a tough-cookie bathhouse worker (and a weasel spirit going by what The Art of Miyazaki's Spirited Away says) who begrudgingly sneaks the main character, Chihiro, through the levels of the bathhouse to meet the boss, Yubaba, so that Chihiro can ask for a job. Shortly thereafter, Chihiro, now called Sen, is assigned to be Lin's assistant in cleaning and preparing the baths for the customers. Lin gives the impression of being hard-shelled and abrasive but when she is alone with Sen, or if it looks like Sen is in danger, Lin's loyalty, kindness, & big sister personality come through. In one particular scene, Sen is sitting alone on a moonlit balcony overlooking the newly formed sea, reflecting on the significant event that took place in the scene before. Lin shows up with a plate of steamed buns (she calls them dumplings in the English version) snagged from the festivities going on inside. She hands a bun to Sen and then eats her own bun while lying next to Sen on the balcony. Lin’s gift of food not only shows her kind heart but also alludes to the bond forming between Lin and Sen. This gesture, in light of the previous scene's major event, is also telling of Sen’s growth into her current situation. The fact that the food is warm bread, symbolic in many cultures of comfort and home and basic human need, can be related to the importance of Sen’s relationships and the necessity of her personal growth, two major themes in the film. The bread could also be seen as a nod to the fact that Sen is now in the workforce and striving for the benefit of her family (this is the basic idea behind the term “breadwinner”). 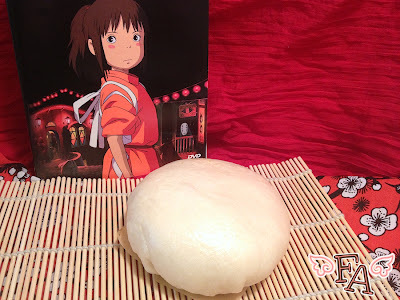 Unwinding the symbolism string even further, the bun appears to be filled with anko, sweet red bean paste (made from adzuki or azuki beans) and one could say that it foreshadows the sweetness at the heart of Sen/Chihiro’s journey. ☉ Dissolve a sprinkling of sugar in the warm water & then add the yeast. Let it sit with a towel over the bowl, undisturbed, for a few minutes so it can get foamy. ☉ In a large bowl, whisk together the dry ingredients & make a well in the center. ☉ Whisk the canola oil into the yeast until thoroughly combined. ☉ Pour the yeast mixture into the well of dry ingredients in the large bowl & combine with your hands. Knead the dough until it is smooth & no longer sticky. ☉ Form the dough into a ball & place it in a lightly greased bowl with a damp towel over the top. Let it rise for about an hour. ☉ Sprinkle a very small amount of flour on a clean, flat work surface & roll the dough into a log shape. ☉ Roll each dough piece into a ball & cover with a damp cloth to rest for about 15 mins. ☉ Using your hands & then a rolling pin (optional), flatten each ball, keeping the center a little thicker than the edges (because you'll be gathering the edges up in a minute & they will become thick if you're not careful!). ☉ Gently gather the sides in by making pleats, pressing them together & keeping them thin as you go around, building up the sides & bringing the edges closer & closer together. ☉ Close the bun by carefully twisting the dough together & pinching off the top. Incorporate the excess dough into another dough ball. Let the bun rest a minute or two before continuing. 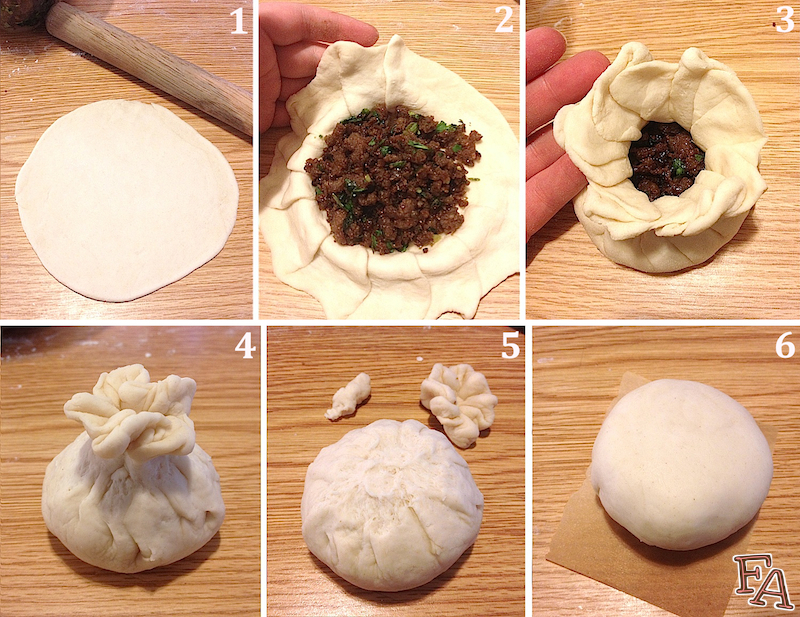 ☉ Place the closed bun, seam side down, on a strip of parchment paper & place it in the steamer. If you have a large steamer that can hold more than one bun, with the buns being at least an inch apart, wait until you've made the number of buns you can fit before placing any in the steamer. ☉ Steam the buns (or bun) for 15 minutes (if you are steaming only a couple of tiny buns, take a few minutes off of the steaming time). ☉ When the time is up, remove the steamer lid quickly, trying not to let any of the condensation fall onto the buns, & remove the buns using the ends of the paper strips. * a dough ball a little smaller than what can sit nicely in your cupped hand is a decent size. ♥ a little tip: add a small amount of vinegar to your water. This is said to keep your buns white. ★ strips, instead of squares are helpful when it's time to remove the buns from the steamer--you can lift either side of the paper strip instead of touching the hot bun directly or using a utensil to get it out. ♦ seriously, the Nutella is very good. 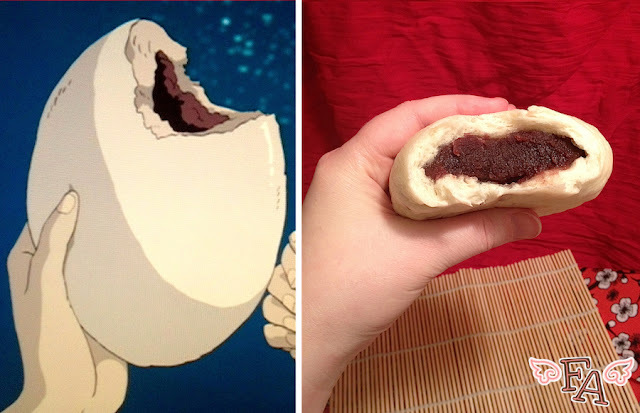 I chose it for all of those people who have been betrayed by the traditional red bean paste filled buns, who took a bite thinking it was chocolate. B, this is for you. But get to it before Smalls does or else all you'll find is a little Nutella smeared face. ✢ if you want to store your buns in the fridge, simply use plastic baggies or plastic wrap. You can reheat them by covering them with a damp cloth or paper towel & microwaving them for about 30 seconds. You can freeze your steamed buns by placing them on a tray in the freezer, not touching, & then, once they are frozen, you can put them in a plastic bag together. To reheat, cover them with a damp cloth or paper towel and microwave for about 45 seconds. 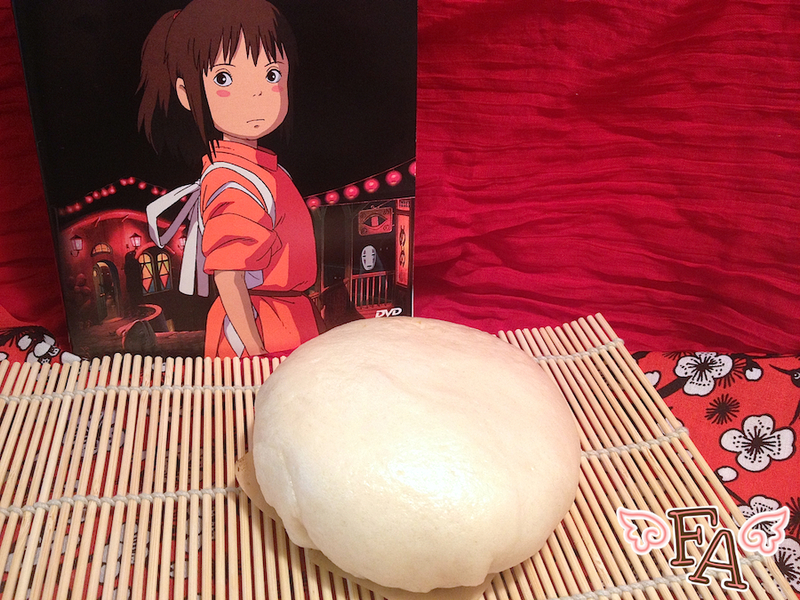 You can also freeze raw, un-steamed buns in the same way as described above. When you want to eat them, simply steam them for about 20min. Brilliant! These are beautiful and look so tasty. I will so be making these for the Miyazaki movie marathon that floats, shimmering and imagined in my heart. 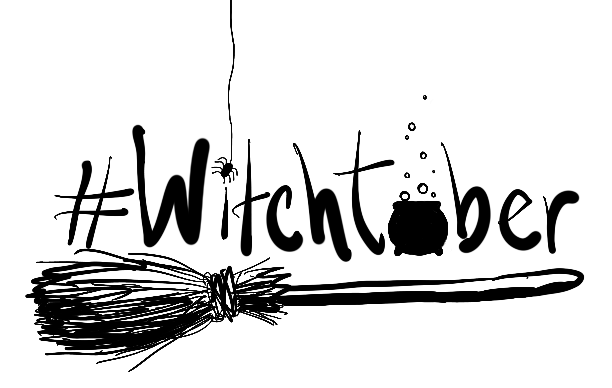 This site is beautiful-- keep up the amazing work here! And Merry Christmas!! Thank you! 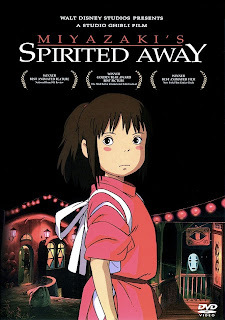 Yes, Miyazaki films are so beautiful. I hope you enjoy these buns! 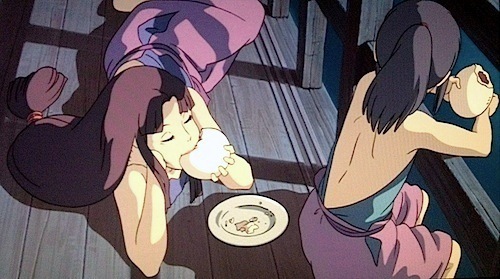 they are these globular tan things that look like tiny fat chickens (because of the bits sticking out) but when eaten with chopsticks they look like they behave like water balloons, or little bags stuffed with jelly, You can see them in the beginning of the movie when Chihiro's parent's start eating in the shop without permission, in the pic chihiro's father is picking it up. I've had my eye on these for a long time. They are very strange indeed! I first thought they were like a boiled onion because of the lines and color, but the little "wings" poking out negate that idea. Yes, many have theorized that the food is bawan, or a type of gelatinous pork dumpling, but that doesn't explain the look any better, and I don't think you can pick it up like he did. 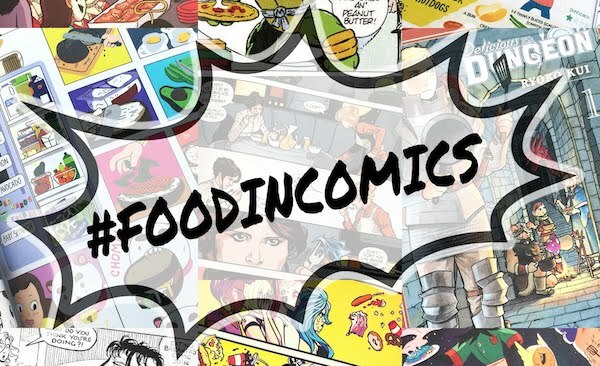 So....I'm gonna say that it's probably a made up food inspired by a couple of real life foods. A decadent and strange food of the spirits that looks enticing and odd at the same time. I have done some experiments on recreating it, so hopefully I'll come up with something to share in the not too distant future. 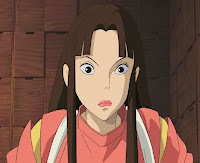 But as of now, there is no official (from Studio Ghibli) explanation of the food, only theories. Great question! I think it's the meat dumplings because of the little poky things they have the resemble the wings. hello! i really want to make these, but i dont have a steamer!! is there any way to do this without a rice steamer or steamer of sorts?? thanks! !